The 'little' of this next design concerns a similar theme to two previous LittleVis posts (#10, #14) about squeezing more potential from annotated features. 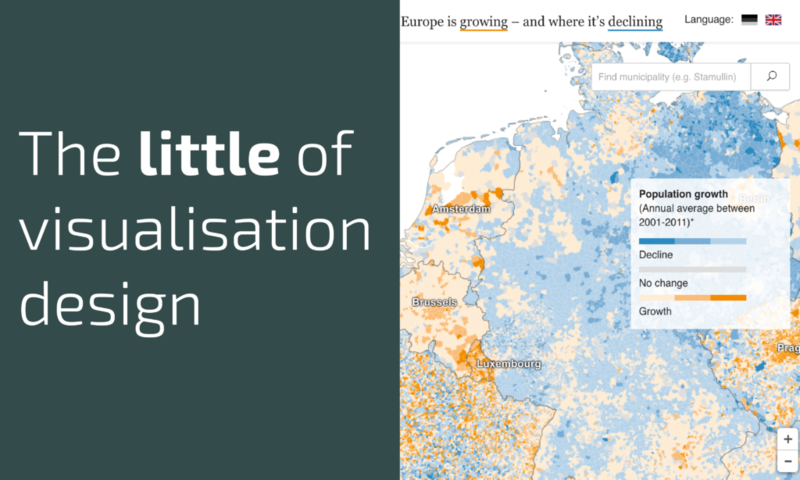 In this case it is about a clever little design choice incorporated into a project's title: the project being 'Where the population of Europe is growing – and where it’s declining' by the team at Berliner Morgenpost. 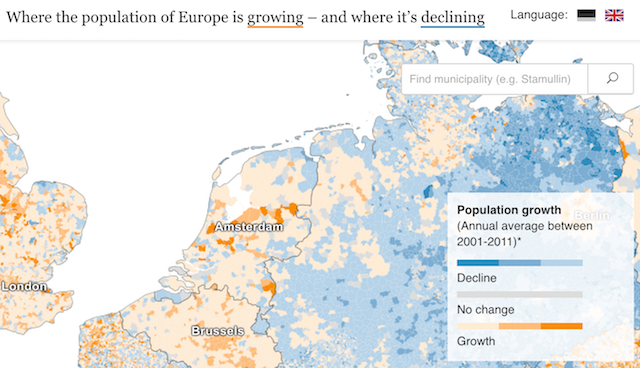 As you see in the title, the colour associations are immediately explained through the underlining strokes, indicating the areas where the population is growing (orange) and declining (blue). There is a more detailed colour key provided as well, but given the title is amongst the first places our eyes are directed towards this immediate colour attribute explanation offers a nice 'quick start' route into the project below. Hi! I like the tip about the title, but have a question about the legend. The values represent a single continuum, but divide the legend into three separate vertical elements (Decline, No change, and Growth). The individual scales may be ambiguous without additional information. In Decline, the right third represents less Decline; while in Growth, the right third represents more growth. Granted, for those familiar with map conventions, darker values are generally associated with more extreme values. However, this is not explicit and may not be understood by all readers.This seems to unnecessarily tax the reader’s ability to interpret the scales. I am wondering if displaying the entire range on a single line might be more appropriate.